Above: An open plan kitchen creates a more welcoming space for serving and entertaining while keeping traffic away from food prep. Photo by Aaron Ziltener / Neil Kelly Company. Where does everyone convene during a holiday party? You guessed it: the kitchen. 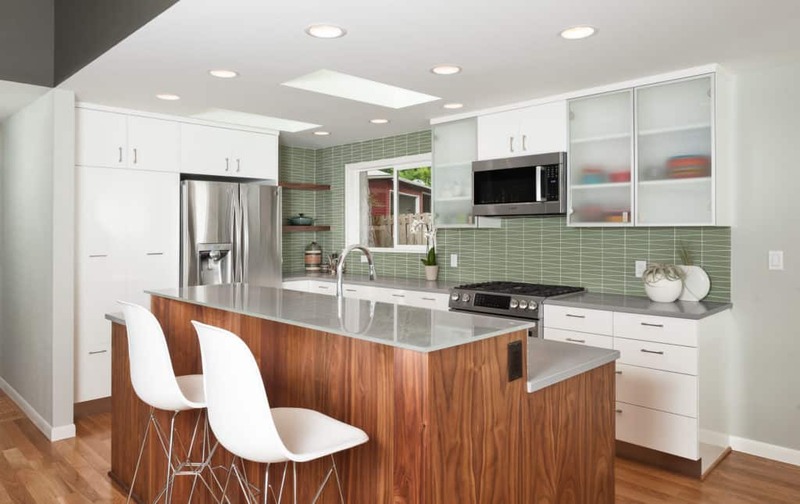 Many older homes are designed with small, tight spaces — and kitchens — and many homeowners might not have the budget to take out walls to make more room. That’s where a good designer comes in. A designer who has the eye and experience to utilize small spaces efficiently can help even the most snug of kitchens feel roomy and welcoming. For example, placing kitchen appliances on one side of the kitchen creates a natural place for food and dishware on the opposite counter — where foot traffic won’t bother the chef. Media rooms, popular in the 1990s, are now being used for more than just big-screen TVs and plush lounge chairs. Today’s families are using these multi-purpose rooms to play board games, watch movies, relax and gather with friends and family. “Creating these spaces allows kids to be loud, play games or watch a show and be a little bit separated from the main hub of the house,” says Neil Kelly Design Consultant Therese DuBravac. 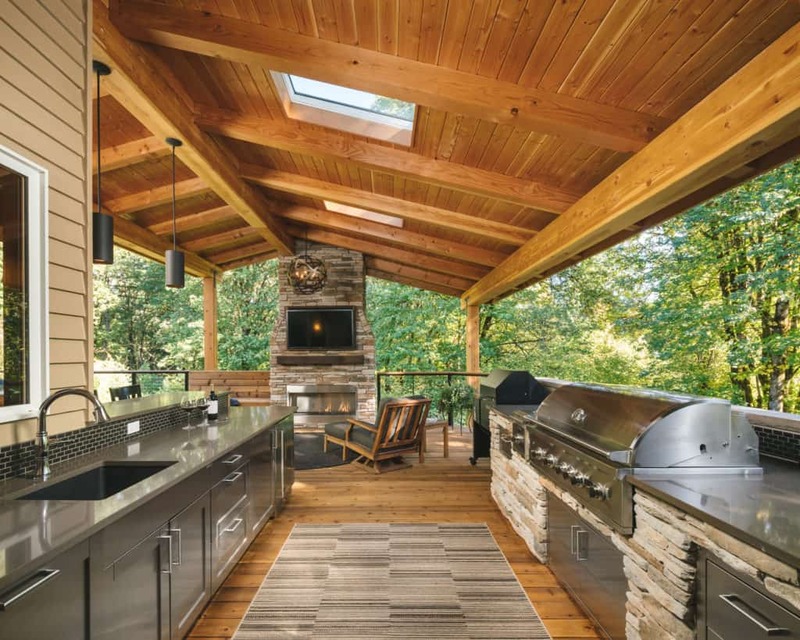 Above: An outdoor kitchen is an ideal overflow space for people who love entertaining. Adequate shelter will prevent the weather from spoiling the party! Photo by Darius Kuzmickas / KuDa Photography. To make more room, don’t forget outdoor or auxiliary spaces for your holiday gathering. Consider your decks as an overflow space for guests. For our wet winters, these spaces should be sheltered to protect guests from weather. Many decks and patios incorporate drop-down canvases and a space heater or two to make your outdoor space feel comfortable year-round. “These kinds of options provide more square footage without having to do a full remodeling addition. People love being outside, and having a warm, sheltered space is a way to make them comfortable while adding space,” says Dubravac. Above: Island seating gives guests a comfortable place to carry on a conversation with hosts. Photo by Aaron Ziltener / Neil Kelly Company. A thoughtfully designed space, no matter the square footage, will always trump endless square feet. “I’ll often have clients say ‘wow, I didn’t even think of that,’” says Dubravac. Sometimes all it takes to transform a space are minor arrangement tweaks or better storage. Pull-out cabinets make a great space-saving substitute for larger walk-in pantries, and many homes have a room that can be repurposed when company calls. “Being smart is the big thing to remember here. The value of a designer is the ability to come up with some creative solutions, whatever your square footage is,” adds Dubravac. Need a creative eye to help you find or create new spaces for entertaining? 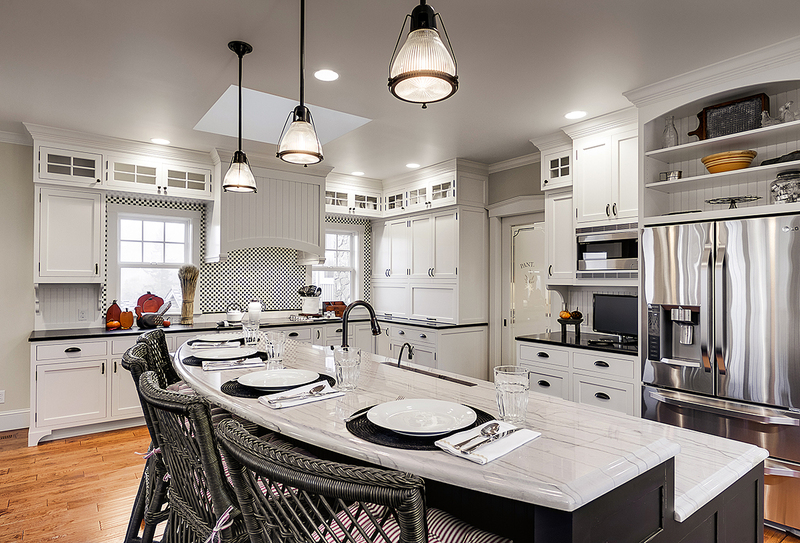 Neil Kelly can provide the services and know-how, from adding new shelving to full kitchen remodels. Get in touch! Looking for our Lake Oswego location? We’ve consolidated operations in our N. Portland office.